Let it go! Let it Go! Who hasn’t had that wonderful song playing at some stage since the movie Frozen was released! Kids have literally become obsessed with the film since it first hit our big screen. In fact I bet a few parents have too if they are being honest! So, what could be more fun than to have a Frozen themed birthday party for you children? I have come up with 20 Frozen birthday party ideas that will help you plan for an AMAZING and totally AWESOME birthday party. 1. DIY Frozen Rock Candy: These Sweet treats would be a great addition to a frozen themed birthday party by Do It and How. 2.DIY Frozen Party Slime Kids love to get a little messy. This wonderful Blue Slime is easy to make and will provide lots of fun at the party by Growing A Jeweled Rose. 3. Frozen Party Punch This gorgeous icey drink would have your little Olafs smiling from ear to ear by A Night Owl. 4. Disney Frozen Ombre Rice Krispie Treats Look divine and would make a great addition to your Frozen Party food by Two Sisters Crafting. 5. Frozen Olaf Jelly will make any Frozen themed party table look fun, Olaf looks so relaxed by Karas Party Ideas. 6. These Frozen Party Invites look fabulous and best of all they are totally free by Party and Prints. 7. You can learn how to make this DIY Olaf Party Cake in a video tutorial. The Cake would truly amaze your guests by Yeners Way. 8. Make these Frozen Popcorn Snowballs which I could eat right now! Great idea by Life Made Simple Bakes. 9. These Scrumptious Frozen Jello Ice Cubes are easy to make and will keep the kids chilled. Not only that but they look great too for any Frozen Party by Bubbly Nature Creations. 10. Here is a Great Game DIY Rockin Olaf Bowling which can be made by your kids and looks fantastic by Family Disney. 11. This Frozen Snow Balls game will provide lots of fun for guests at your party! These were made by Paging Supermom. 12. Sing a Frozen it go you could make an individual recording for your guest and send them home with a nice memory of your Frozen Party! 13. These DIY Olaf Marshmallow Heads are yet another great food treat for the kids by Fiesta Scancheras. 15. This Three Tier Frozen Party Cake can be replicated using the great tutorial by Cakes. 15. This Pin the Carrot on Olaf cut outs will be a great addition to your Frozen Party by WdSiemer. 16. Yunny! These Disney Ice Swirl Cookies made by Midget Momma look amazing and I am sure they will hit your children sweet spot at the Frozen party! 17. Disney Frozen Character Pop Cakes. It couldn’t find who actually made these but hey! They look totally awesome and I don’t think they will be that difficult to recreate. 18. These totally Free Frozen Bookmarks would act as a great gift to give your party guest by Seven Thirty Three. 19. Make an Elsa Dress for the Party Girl. This is a great tutorial by The Girl Inspired. 20. 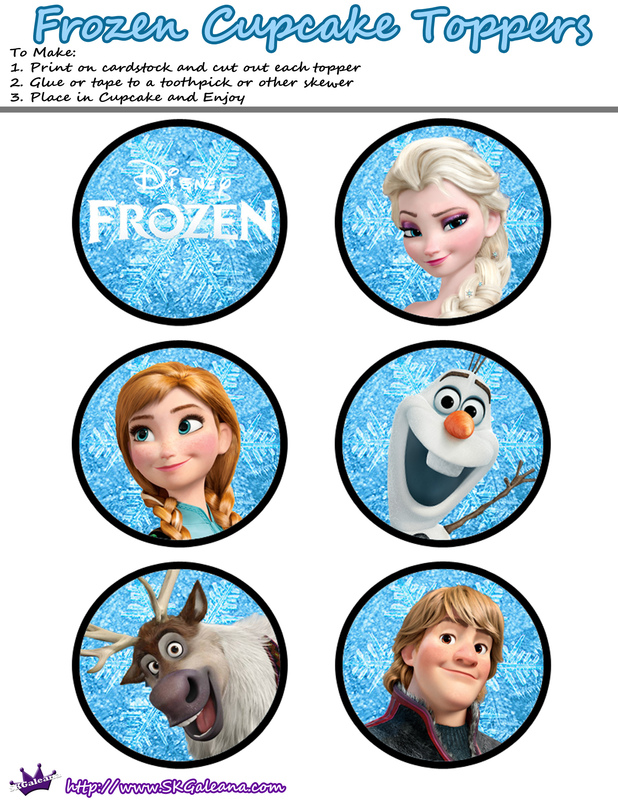 Free Frozen Pop Cake Topper Printables great for adding to the top of your Pop Cakes by Skgaleana. So, you can use some or all of these great Frozen Birthday Party Ideas for your themed Disney Party. Oh, my niece would of loved a Frozen themed birthday. Seeing posts like this makes me wish my boys were into Frozen! Maybe I can have a frozen party for my birthday next year! I love these awesome ideas! Thank you for sharing! Wow what awesome ideas that i;m sure would be a hit with any frozen fan! Being a fan of olaf i particularly love the diy rockin olaf bowling. This has so many good ideas just in time for my granddaughter’s birthday. THESE ARE SO FANTASTIC FOR A PARTY, MY LITTLE ONES BIRTHDAY IN FEB SO WILL HAVE A GO AND HOPE THEY TURN OUT AS FAB AS YOURS! My 5 year old niece would love making the Olaf marshmallows. As long as she doesn’t sing.